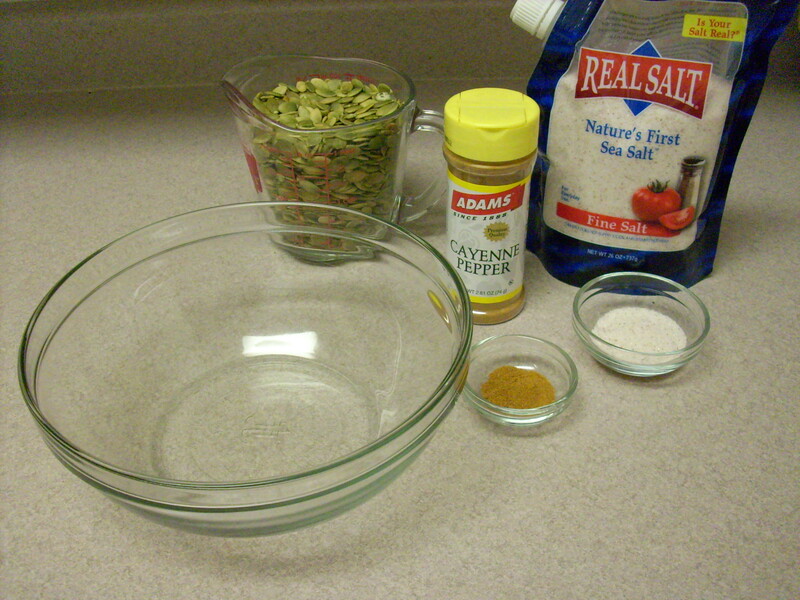 Today, I wanted to share with you a recipe for a new favorite snack food of mine. Crispy pumpkin seeds! Not only are they tasty, but they are also very nutritious. 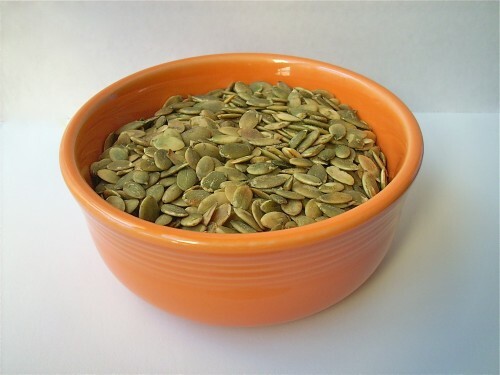 Did you know that pumpkin seeds are a rich source of protein, monunsaturated fats, and healthful minerals? I had no idea myself until a few months ago. Back in November, I wrote about a cookbook called Nourishing Traditions that I had recently purchased. In it, the author explains that nuts and seeds contain several enzyme inibitors, which can put a strain on our digestive mechanism if consumed in excess. She goes on to say that nuts are easier to digest, and that their nutrients are more readily available if they are first soaked in salt water overnight, then dried in a warm oven or dehydrator. Soaking them in salt water activates enzymes which neutralize the enzyme inhibitors. The Aztec people did this with pumpkin seeds and squash seeds, which were then eaten whole or ground into meal. 2 cups of raw, hulled pumpkin seeds (certain markets usually have these in the bulk section), sea salt, water, and cayenne pepper. 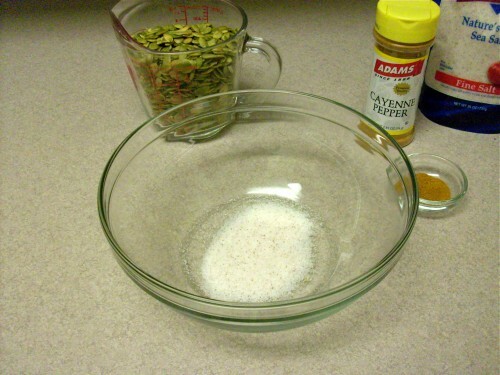 In a medium sized bowl, place one tablespoon of sea salt. Add your water, and let the salt dissolve. Add your pumpkin seeds and cayenne pepper. I actually add more than a 1/2 teaspoon to mine because I love spicy food, but you can use less or omit it all together. I really don’t think that they would be as tasty to me without it though. Gently stir it around a little bit. Looks really yummy at this point, huh? Put in a warm place overnight, or for at least seven hours. I usually do this just prior to bedtime, and finish them in the morning. 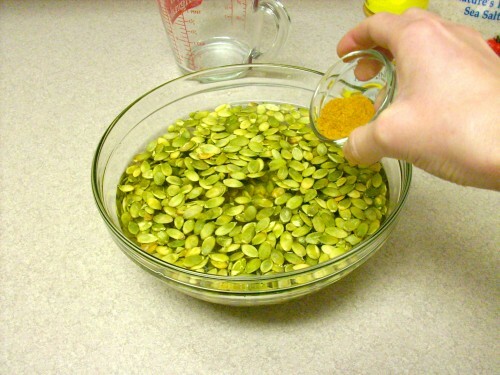 The pumpkin seeds will take a few hours to dry in the oven, so plan to do this when you have a day at home. After they are done soaking, drain them in a colander, and spread them out on a large sheet pan. Place the sheet pan in a warm (150°) oven. My oven only goes as low as 170°, so I use a butter knife to hold the oven door open a crack. Not ideal, but it works for me. Leave them in the oven until they are completely dry and crispy. This usually takes about 5-6 hours when I do it. The drying time may vary depending on your oven. I would just keep an eye on them, and check them by eating a couple. You know they are done when they are really crunchy. Happy snacking! 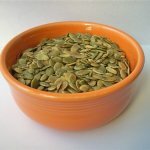 If you own a food dehydrator, you can use it to dry the seeds instead of the oven. Directions for how to dry nuts and seeds in a food dehydrator can be found on the GNOWGFLINS website. 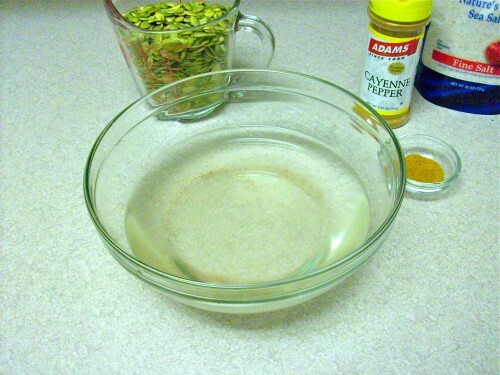 In a medium bowl, dissolve the sea salt in the water. 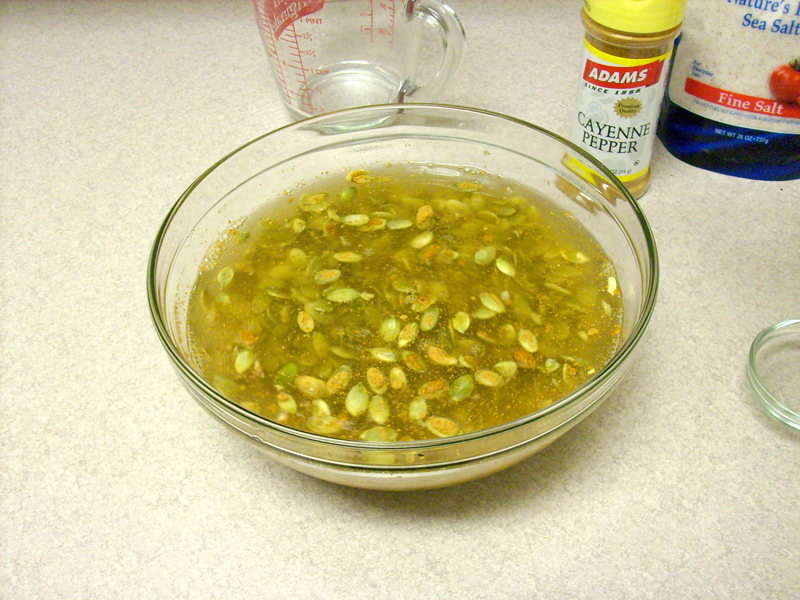 Add the pumpkin seeds and cayenne pepper. Gently stir the mixture for a few seconds. Place in a warm spot and let sit overnight or for at least 7 hours. Drain the pumpkin seeds in a colander, and spread them out on a large sheet pan. 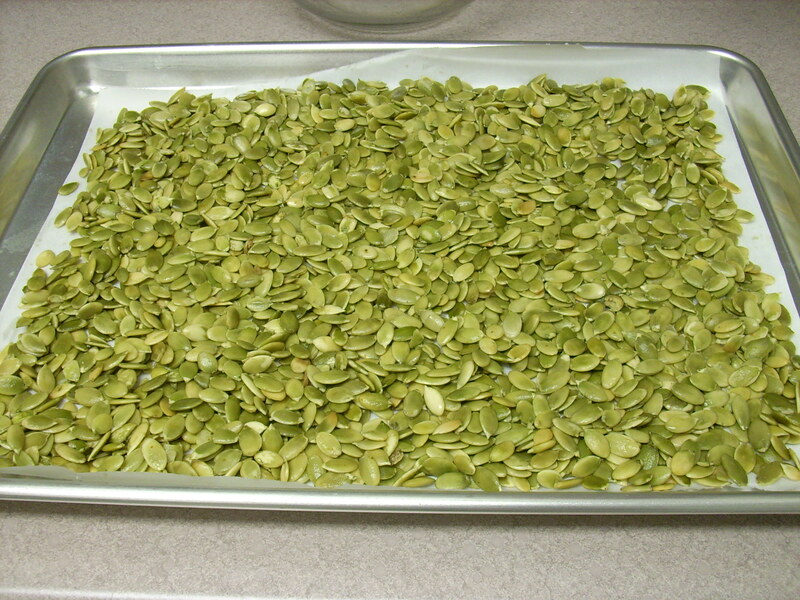 Place in a warm (no more than 150°) oven for 5-6 hours or until the seeds are completely dry and crunchy. Store in an airtight container. Recipe adapted from Nourishing Traditions cookbook. My family loves pumpkin seeds. They are such a nutritious snack. Your recipe sounds so good! Great idea to have these on hand! !